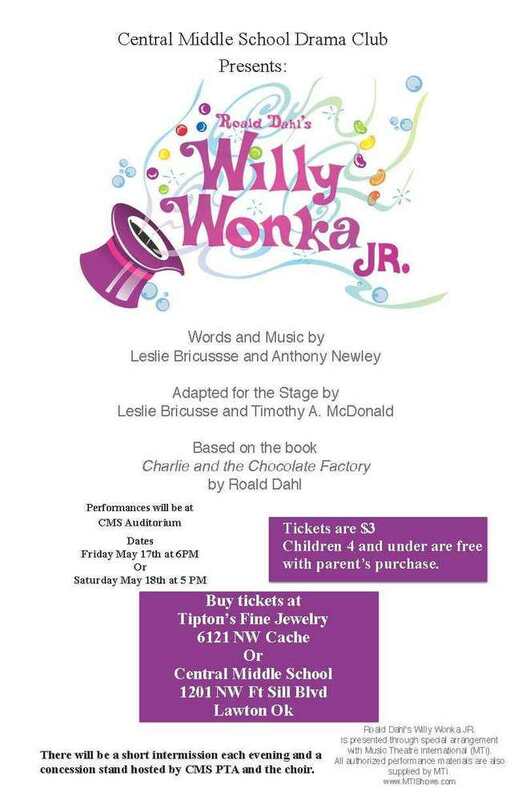 Central Middle School (CMS) Drama Club will present Willy Wonka Jr. at 6 p.m. on Friday, May 17, and at 5 p.m. on Saturday, May 18, at the CMS Auditorium, 1201 NW Ft. Sill Blvd. Concessions will be available the night of each show. Tickets are $3 per person, and children four years and younger get in free. Purchase tickets at CMS or at Tipton's Fine Jewelry, 6121 NW Cache Rd.